We were excited to host you in our booth during the Seoul Food & Hotel Show 2018. This was our first time exhibiting in the Korean market and we thank you all for the welcoming reception and the overwhelming interest in our products. This year we exhibiting at USA Pavilion, Booth 3B305. 건강한 생활 양식을 유지하도록 돕는 고기능성 슈퍼 푸드로 보강된, 설탕과 화학 첨가물을 전혀 추가하지 않은 Smartfruit의 제품은 non-GMO과일로 만들어졌습니다. 과일 퓌레. 스무디, 주스, 프라페, 파르페, 이탈리안 소다, 냉동 요구르트, 아이스크림, 티, 차이 및 그 외 많은 것들을 만들기에 이상적입니다. We are super excited to exhibit this first time both at the SFH show and in South Korea in general! This year we’ll be waiting for you at USA Pavilion in Booth #4A16. We look forward to finding some great partners to work with. 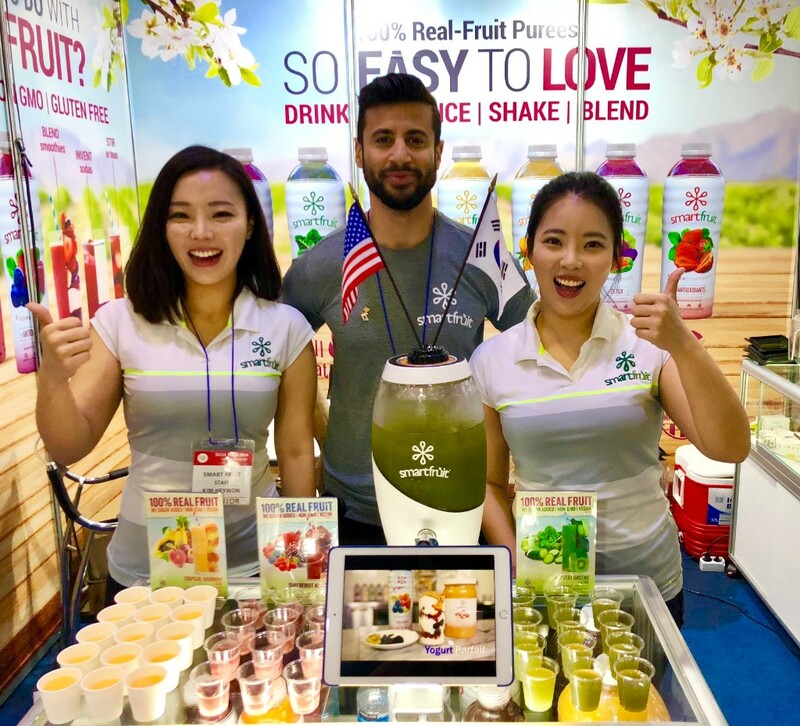 Seoul Food and Hotel, the gateway to Korea for international exporters, continues its role the country’s most important trade show for the entire food, beverage, foodservice and hospitality industry and returns for its 2018 edition between 1 – 4 May 2018. Once again SFH will offer 4 days of uniquely trade-only buyers including key importers, distributors, restaurateurs, retailers and hoteliers from the whole of Korea. As a nation of food lovers who have ever-evolving tastes, and where global food trends are always developing, Korea’s demand for new and innovative international food products continues to grow. Add to this Korea’s position as a proponent of Free Trade Agreements (with ASEAN, EU, USA, Canada, Turkey, Pacific Alliance and more) it is clear to see why there is continued and growing demand for exporters from the F&B industry, to access the Korean market.